Need a solution? We supply Food and Beverage related products. KOTI-Dawson provides a whole range of brush solutions for bakery and commercial food heat processing equipment. Head cleaning roller brushes for plate link, wire mesh, flexible rod and eye link belts are suitable for hot oven, cooling or uncooked dough conveyor lines. Versatile tufted brushes remove excess pastry, clean baking moulds, sieve flour, sprinkle icing sugar, guide and position products in packing. Custom designed to achieve the right aggressiveness, direct food contact and wash down requirements, we will work with you to improve productivity and quality of your particular application. 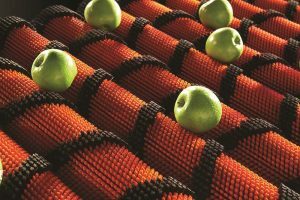 Growing consumer demand for healthier and fresher produce and environmental requirements to prevent erosion is driving the need for efficient, high grade washing and polishing of fruit and vegetables on the land with minimal preparation time. 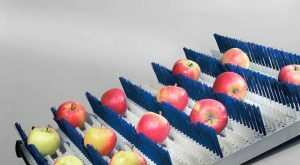 From harvesting, processing to pack-houses, Quick Snap roller brushes gently clean, polish and transport pomaceous fruit and root vegetables without damage, promoting greater product yield to fulfil customer demands for quality and freshness. However automated your conveying and packing line may be, sometimes you just need that extra gentle touch. Whether it’s to guide and position cans, bottles or cartons, apply pressure to labels and wrapping or to simply reduce that constant rattle, nothing beats the versatility and effectiveness of our brush laths, segments and brush strips. 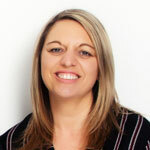 Keeping equipment and working areas clean and organised is paramount to comply with food safety laws. 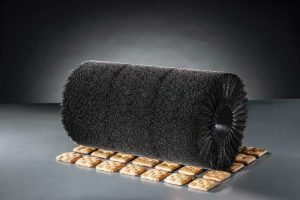 Tufted lath brushes and roller brushes in cleaning stations to eliminate cross-contamination in hygiene critical areas. Axial strip roller brushes or tufted split core roller brushes remove all types of residues and provides continuous cleaning. Simple to maintain and virtually self cleaning, both axial and split core brushes can be replaced without removing the shaft. Paired brushes automatically clean chains, trolley wheels and brackets of overhead systems while the system is in operation, removing residues to keep the system clean and hygienic. 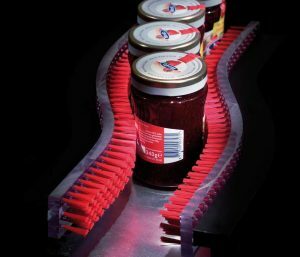 Brush strip seals gaps without impairing moving parts and clean track conveying systems of dirt, residues and contaminants.